Today the UK Government has published the latest in its series of Brexit policy papers, this time taking on how the issue of ‘Enforcement and Dispute Resolution’ in UK-EU relations will be resolved. This is all part of an attempt by the Government to get on the front foot in shaping negotiations which thus far have been driven by the well-oiled Brussels negotiating machine. To date, there has been an apparent gulf between the two sides. In her Lancaster House speech back in January, the Prime Minister Theresa May set out her Government’s approach to Brexit. Echoing one of the key themes of the ‘Vote Leave’ campaign, she stated that: ‘we will take back control over our laws and bring an end to the jurisdiction of the European Court of Justice in Britain’. To date, it has seemed possible that the differences in approach between the UK and the EU might derail negotiations with both sides locked into their own ideologies. On the UK side, the ideological element is rooted in a belief within government that what matters is to ‘keep faith’ with the referendum decision. Given that taking back control from the Court of Justice was one strand of the Leave campaign, for some – including the Prime Minister – this means an inability to agree anything that will see a post-Brexit role for the CJEU. As the White Paper presented to Parliament in February states: ‘We will take control of our own affairs, as those who voted in their millions to leave the EU demanded we must, and bring an end to the jurisdiction in the UK of the Court of Justice of the European Union’. The EU side may equally have too much ideological skin in the game to allow for compromise solutions to be found. The attachment to the autonomy of the Union legal order and the Court as its institutional safeguard casts the CJEU in the somewhat heroic role of the constitutional guarantor of the rights of citizens. And yet it is the national courts that in the end do much of the judicial heavy lifting. The European Court of Justice has limited powers to give remedies whereas the national courts have access to a wide range of remedial orders. Only if we are really honest about the appropriate division of responsibilities between the CJEU and the national courts and between the use of judicial and non-judicial dispute resolution mechanisms will negotiations be able to move forward in designing a post-Brexit dispute-resolution and remedial architecture. Today’s paper from the Government is a very welcome appraisal of the range of possible mechanisms for the enforcement of rights and obligation under any agreements reached between the UK and the EU, and for resolving disputes that may arise under those agreements. Rightly, the paper recognizes that where such agreements create rights and obligations enforceable by private parties, it shall be for the national courts – the UK courts and the courts of the EU Member States – to provide effective judicial protection. That includes citizens’ rights. It has always been overly simplistic to see the Court of Justice as the guardian of these rights. While its interpretation of what rights EU citizens possess is, of course, a matter entirely within the Court of Justice’s jurisdiction, the practical enforcement of these rights and the remedies needed to protect them has always been for the national courts to provide. The Government is well within its rights to highlight the central role of UK courts in doing the heavy lifting in the protection of rights and enforcement of obligations under any Withdrawal Agreement. Indeed, the UK is keen to deploy the issue of the ‘autonomy’ of legal orders – often a trump card played by the Court of Justice – against the EU in order to demand respect for the autonomy of the legal orders of the UK (recalling, of course, that the UK is multi-jurisdictional itself given the autonomy of Scots Law in particular). The paper is also right to distinguish the enforcement mechanisms for the correct application of any agreement, from the dispute resolution mechanism for issues arising from the incorrect application of, breach of, or interpretative deviation from, any such agreement. It draws inspiration from the dispute resolution mechanisms under a variety of EU agreements – free trade and association agreements – to highlight the range of political and non-judicial mechanisms that might be deployed. It notes the legal impediment that may arise from EU law itself in creating new judicial organs to interpret and enforce agreements insofar as they might encroach upon the jurisdiction of the Court of Justice. It was precisely because of the objections of the Court of Justice to the establishment of a new court under the EEA agreement (Opinion 1/91) that we ended up with an EFTA Court and the Court of Justice operating parallel jurisdictions in the applications of the EEA Agreement. Indeed, there is much in the paper which clearly draws inspiration from such a ‘twin pillar’ model, including the role of a Joint Committee to mediate between the two pillars in finding solutions to problems that might arise. It is worth recalling that in the EU’s own position paper, the idea of a Joint Committee is floated as a dispute resolution mechanism. Intriguingly, the paper notes that under the EEA Agreement – Article 111(3) – the contracting parties may agree to ask the Court of Justice to give an interpretation of the relevant rules of the agreement where they are identical to provisions of EU law (the parties having already agreed that in situations where the rules are identical the meaning should be the same). That the Court of Justice might be given such a role under any agreement between the UK and the EU leaves open the question of whether this amounts to a backtracking on the commitment to end the jurisdiction of the Court of Justice post-Brexit. At a rhetorical level is it striking that there are multiple references to excluding the UK from the “direct” jurisdiction of the Court of Justice. This might entail two rather different things. At a domestic level, it could mean that while UK courts will lose powers to refer issues of interpretation to the ECJ, UK courts will continue to have regard to, or take account of, judgments of the Court of Justice but without being bound by them or obliged to follow them. This sort of consistency or “homogeneity” principle is part of the structure of the EU’s relationship with the EFTA states through the EEA agreement. The EFTA states are not under the jurisdiction of the Court of Justice (direct or otherwise), but instead fall under the jurisdiction of the EFTA court. Nonetheless, the homogeneity principle seeks to secure compliance with the same rules as between the EU and EFTA states. Similarly, national courts can follow principles of consistent interpretation. Clause 6 of the European Union (Withdrawal) Bill permits UK courts to interpret “retained EU law” in accordance with any retained case law. This retained case law includes EU case law, meaning “any principles laid down by, and any decisions of, the European Court, as they have effect in EU law immediately before exit day “ So even in advance of the negotiations with the EU, the Government seems ready to allow ECJ case law as it exists prior to the UK’s departure to have a direct influence on UK law, but without the Court having direct jurisdiction (something which clauses 6(1) and (2) of the Bill seek to exclude). The other sense in which “direct” jurisdiction may be excluded is to give this an entirely formal meaning in the sense that once the UK withdraws from the treaties that confer jurisdiction on the Court of Justice, by necessity, those treaties will not themselves directly create a continuing jurisdiction for the Court over the UK. That would not prevent, however, new treaties or agreements between the UK and the EU from creating such a jurisdiction. So in much the same way that other aspects of Brexit will seek to keep things the same through the adoption of mirror or shadow legal provisions, it is not implausible that new legal frameworks agreed between the UK and the EU could create a role for the ECJ. To return to the example of Article 111(3) of the EEA Agreement, the limited jurisdiction of the Court of Justice arises under the EEA Agreement and not the EU treaties and only where the contracting parties agree to refer the question of interpretation to that Court. This may seem like drawing fine legal distinctions but they do create wiggle room for the government in keeping faith with its promise to end the jurisdiction of the Court while also allowing it some room for manoeuvre in the negotiations. Today’s paper also highlights the role that might be played by arbitration under any future trade deal and by systems for monitoring and reporting to determine whether there is continuing compliance. Overall its strategy is to say to the EU that there is more than one way to skin the dispute-resolution cat. The focal point for this paper is clearly upon the withdrawal agreement and any future trade agreement with the EU. In reality, there will be a range of legal instruments producing rights and obligations applicable in a post-Brexit world. These include: (1) the current treaties, the rules made under them, and the principles applicable to them; (2) the withdrawal agreement(s); (3) measures taken by the UK to implement the withdrawal agreement(s), as well as instruments to preserve and convert EU law within domestic law; (4) any agreement on transitional arrangements; and, (5) a future ‘deep and special’ partnership agreement between the UK and the EU. There are different things that the parties to any dispute might need or want. These include: (1) an authoritative interpretation of relevant law; (2) a means of seeking to challenge the validity of a legal instrument; (3) mechanisms for managing and resolving disputes; (4) remedies for the enforcement of duties and the protection of rights; and (5) reciprocal means of enforcement of judgments rendered by courts, including those of the national courts of the UK and the EU27. And there are different potential plaintiffs and defendants in any future disputes. These include: (1) the United Kingdom; (2) the 27 Member States; (3) the EU, its institutions, agencies and bodies; (4) UK citizens and companies; (5) citizens and companies from the EU27; and (6) other countries, their citizens and companies. It should be abundantly clear that to reduce the debate down to a proxy referendum on the jurisdiction of the CJEU – Yes or No – is to fail to take seriously the keyword: ‘jurisdiction’. What negotiators needs to get right is the relative jurisdictions of EU and national courts, as well as the relative division of roles between judicial and non-judicial institutions. It is to be hoped that today’s constructive paper is a sign that the UK is willing to get out of its ideological silo and to focus on what sort of dispute resolution mechanism is needed for what type of problem. One can only hope that the same will be true on the EU side. The UK Government has published its anticipated ‘partnership paper’ on a future customs arrangement with the European Union. Much of the paper is a statement of generalities about the Government’s commitment to, and aspirations for, free trade notwithstanding the UK’s decision to detach itself from its principal trading party, its Single Market and its Customs Union. Indeed, the first line of the paper’s ‘executive summary’ states in clear terms that when the UK withdraws from the EU it will leave the Customs Union. To underline the point, the paper repeatedly states that whatever future customs arrangement the UK agrees with the EU, ‘the UK would seek to pursue its independent trade policy objectives’. Given that membership of a Customs Union means that member countries align their trade policies and apply a common external tariff, this would be incompatible with what appears to be the prime directive of government policy, namely the pursuit of an independent trade policy. At the core of the paper are two principal options for future customs arrangements. The first option would be to adapt existing procedures for handling the movement of non-EU goods within the EU (and also EFTA states) to now include good originating in the UK or imported into or transiting through the UK. Sensibly, the paper reflects the significant improvements which have been made over the years to streamline formalities and to use technologies like the New Computerised Transit System (NCTS) to avoid the need physically to present goods at customs offices for customs clearance. Significantly it also points to membership of the Common Transit Convention which manages the procedure for the transit of goods (EU and non-EU) not just through the EU but also other countries that are parties to the Convention (Article 15a would allow the UK to accede to that Convention). What is vital about this model is that it tells us virtually nothing about the underlying regimes that would apply to goods in the UK and the EU in respect of (1) applicable tariffs (2) taxes (3) other charges including any relevant anti-dumping measures and (4) regulatory standards including health and safety requirements. This is all about trade facilitation between the EU and the UK as a new non-EU state at an administrative level rather than at a regulatory level (see para 38 of the paper). The second option is some sort of new customs partnership that fall shorts of the existing Customs Union. This could see the UK effectively acting as the agent of the EU in applying the EU’s external trade policy (including ensuring that applicable EU tariffs were paid) for goods entering the EU via the UK. For goods destined for the UK, the UK would apply its own trade policy including applicable tariffs. But what remains unclear is what tariffs would be applicable for goods that are placed on the UK market but then sold onto the EU market. All of which depends on whether there is a trade agreement between the UK and the EU and, if not, what limitations WTO rules might impose. In other words, this puts the cart before the horse: we don’t know what the customs side should look like until we see what the trade (and other regulatory) terms will be. The UK has also set out its proposals for a time-limited ‘interim arrangement’ pending agreement on a future customs and trade deal. It envisages a ‘new’ customs union with a shared external tariff. There would need to be a mechanism for apportioning how this tariff would be paid to the UK and EU respectively. But the major difficulty would be how to reconcile this new customs union with the Government’s ambitious trade policy agenda. The paper attempts to square the circle by stating that while it would ‘pursue new trade negotiations’ it would not bring into effect any new arrangements that were not consistent with the interim deal with the EU. However, in practice, the UK will need to settle its future trade relationship with the EU before it can realistically hope to come to arrangements with other non-EU states. The result would be that the UK would have left the Customs Union only to replicate it but with all the uncertainty over whether any future trade deal with the EU – and on what terms – could be agreed. Meanwhile the issue of the border with Northern Ireland depends not just on smoothing the formalities of customs administration but also, again, on knowing what the future trading relationship between the UK and the EU will be. And as long as Government policy is overshadowed by a focus on trade deals outside the EU and insufficiently attentive to how the UK will trade with the EU, these key issues will remain unresolved, heightening economic uncertainty. Much more flesh needs to be put on the bones of Government policy on future customs and trade policies. But whether or not we get to that point still depends on UK-EU negotiations making sufficient progress on other issues including citizens’ rights and settlement of the UK’s financial obligations to the EU: a point made clear in a tweet from Michel Barnier within hours of the publication of the UK’s paper. Emblazoned across posters, leaflets and big red buses, the Vote Leave campaign stated in stark terms that membership of the EU cost UK taxpayers £350 million per week. It was a figure repeatedly challenged by the Remain campaign and by fact-checking organisations who pointed out that it ignored the automatic deduction of a rebate before any contributions are made to the EU budget. It wasn’t even the case that money was ‘sent’ and then a proportion ‘returned’: it was never sent in the first place. Actual contributions vary between years depending on changes in Gross National Income, but with the application of the rebate, in 2014 the weekly contribution was more like £282 million or 14.7 billion for the year. The £350 million figure also failed to account for the money transferred back to the UK public sector under a range of EU programmes. Once these are taken into account the Office for National Statistics calculated the UK’s net contribution in 2014 at £190 million a week or £9.9 billion for the year. But whether the figure was £350 million or some other figure probably wasn’t relevant. The point was that voters either couldn’t see or didn’t value what they got for their money, underlining what has sometimes been seen as a ‘transactionalist’ approach to EU membership rather than a more value-driven concept of membership. Voters were, however, clearer that the UK had experienced a post-financial crisis period of austerity and budget cuts. EU contributions were being made as domestic spending was being squeezed. If we are to understand what taking back control over money might mean, answers lie in the different features of EU and domestic public spending and the relationship between the two. For the EU 2016 budget, annual spending commitments on all EU policies amounted to €155 billion. By comparison, UK government spending in 2016-17 was expected to be £772 billion, with spending on health alone (£145 billion) amounting to more than the total annual EU budget. These figures tell us something important about the differences between EU and domestic public spending. The main items of domestic expenditure reflect the primary role of the nation state in redistributive policies and the provision of public goods. It is precisely in the areas of welfare, health and education that the EU plays a limited role. The EU itself does not provide these public goods and services. Instead, EU spending focuses on a set of policy initiatives that reflect the specific tasks and competences of the EU as well as priorities set by EU leaders. For 2016, the EU annual budget set out principal headings for expenditure: €19 billion allocated to supporting growth, jobs and competitiveness, including €9.5 billion for Horizon 2020, the EU’s strategy to support research and innovation; €50 billion for territorial cohesion (tackling economic disparities between different parts of the EU); and €42 billion supporting farmers under the Common Agricultural Policy. The EU budget is, of course, partly spent in the UK. The most significant funds for UK purposes are the ‘European Regional Development Fund’ (‘ERDF’) which supports disadvantaged regions and the ‘European Social Fund’ (‘ESF’) which promotes skills and training to support labour market participation. For 2014-2020, the UK is allocated €17.2 billion. The European Agricultural Guarantee Fund is the principal source of direct payment to farmers under the Common Agricultural Policy. The allocation to the UK for 2014-20 is €22.5 billion. Once it is recognised that sums of money flow back to the UK from the EU budget, it becomes even more apparent that there never could have been a £350 million a week Brexit bonus for the UK to spend on the NHS. The only way of getting close even to the figure of £282 million that took the rebate into account would be to cut to zero all the expenditure on things like research, regional policy and support for farmers that currently comes back to the UK out of the EU budget. But beyond the narrow narratives of the referendum campaign, the wider context for concerns about control over money were to be found in the post-crisis politics of austerity. For voters who had felt the effects of a shrinking public sector both in terms of employment and the provision of public services, rejection of EU membership was an opportunity to challenge ideas that the economy was either simply a product of market forces or the object of a type of post-political technocratic managerialism that seemed to characterise the European response to the financial crisis of a decade ago. That a Conservative Government was backing EU membership while pursuing policies of austerity that were, in any event, consistent with the prevailing European preference for fiscal discipline, created a focal point for political resistance, not least for traditional Labour voters. Viewed in this way, we can also see more clearly why the idea of diverting resources from the EU to public spending on the NHS might have resonated strongly with voters. A year on from the referendum and the figures for the year in which the referendum was held show that the UK’s net contribution to the EU was £156 million a week. Meanwhile it is also reported that the UK may have outstanding liabilities to the EU of £36 billion that will need to be settled as part of the UK’s withdrawal from the EU. New money will be spent after Brexit but it will be on putting in place new IT systems for customs and immigration and on creating new regulatory structures needed to make markets operate after Brexit. There will be no Brexit social dividend for public services. And the NHS will not get £350 million a week of new spending. Adapted from Chapter 7 ‘Control over Money’ in Brexit Time – Leaving the EU: Why, How and When? which is out now. Like many people, I have been reading the European Union (Withdrawal) Bill since it was published this week. It is a Bill that faces a formidable task: how to create a body of EU-derived law within domestic law when the UK leaves the European Union and how to create mechanisms to allow that law to be interpreted, implemented and amended in the period following the UK’s departure from the EU. Not surprisingly, the complexity of the task is mirrored in the construction of the Bill itself. When thinking about how to blog about the Bill, I fully anticipated that I would be approaching the task like a badly-denimed Top Gear presenter. Circling the Bill, peering under its hood and smugly opinioning to the audience, I expected to be dispensing pithy commentary about whether the Bill was a Fiat or a Ferrari. The tweet incited responses. Many people saw in this the complexity of the legislative task. Others considered it to be a complaint about bad drafting. Still others linked it to the shambles of the politics of Brexit and the policy choices which are being made not just about Brexit but also within the Bill itself. The responses have made me reflect on the types of comments and commentary that people like me make. The first thing to make clear is that the tweet was an honest statement of my own inadequacies. While I understood fully the aim of clause 2, I was perplexed by this particular bit in it. I was rather hoping someone might help. It is one of the upsides of the social media of Brexit that it is possible to tap into a wide range of expertise. And I think that is especially important in the context of the real complexity of Brexit where none of us can lay claim to comprehensive knowledge or expertise. I have no shame in holding my hand up when I don’t understand something and I think it might actually help us all manage Brexit a little better if we could muster some humility. The second point to make is that we need better to distinguish between the policy choices that ministers make and the technical craft of giving effect to those choices in law and in legislation. Rightly, lawyers, academics and others have things to say about those policy choices: from the decision not to include the EU Charter of Fundamental Rights within the corpus of EU-derived law to the discretion which UK government ministers will be able to exercise to make significant changes to these EU-derived rights and obligations. These are the very legitimate objects of commentary and criticism and the language we use in these contexts is part of the wider contestation of Brexit and its implications. But in the process, let’s not shoot the messenger. Public servants – government lawyers, civil servants and parliamentary counsel – face the difficult task of translating those choices into legal language. But they are not the author of those choices and its unfair to conflate the difficulties of decoding legislative drafting with the conduct of government at the level of ministers and their advisors. Which leads me back to the tweet itself. It is also right that now that we have the draft of the Bill that it is properly road-tested. Part of that will be to try and respond to legitimate requests – like my own – for clarification. And part of it will be to see whether the Bill as drafted will function in the way it is intended and without creating anomalies or discrepancies. There is even room to ask whether the same outcome might be achieved in a different way. The legislative process and the scrutiny which attends the Bill is certainly a key way to put this Bill through its paces. But there is also space for wider commentary from academics and lawyers about how they see the Bill working in practice. As a simple example, the Bill uses the term “EU tertiary legislation”. It’s not a term I like. If it refers to what I think it refers to – a world of EU delegated and implemented acts – these are not examples of “legislation’ within EU law but are instead non-legislative acts. These are areas where I think there can be reasonable disagreement about the terms used in the Act. And it is right that I and colleagues offer commentary on the design, structure and content of the Bill. As it happens, I have been offered an explanation of what the previously mysterious Clause 2(2)(c)(ii) means and I now think I understand what it seeks to do (there is, of course, an explanatory memorandum accompanying the Bill but I didn’t find the necessary detailed explanation I was looking for). So I think it’s possible to have a constructive dialogue about the Bill from a technical point of view. But I don’t think we should use that discussion as a proxy or metaphor about the conduct of the government in its handling of Brexit. As a matter of record I want to say that if my tweet was interpreted as a side-swipe against hard-working government lawyers, counsel and civil servants tasked with the unenviable task of embedding EU law in UK law after Brexit, then I offer an apology. The intention was entirely the opposite: a candid admission that after more than twenty-five years of doing EU law I have probably become de-skilled in the ways of UK legislation. That does not bode well for my post-Brexit professional career. 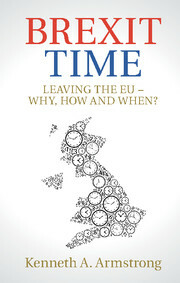 In the introduction to Brexit Time: Leaving the EU – Why, How and When? published last month, I quote from a blog post written by Dominic Cummings, the campaign director for Vote Leave. In that post, he describes a world in which events happen that change the future, but where those events happen in a ‘non-linear’ way. These are the ‘branching histories’ that take us down one road rather than another. Cummings wants us to make sense of our world by seeing how things might have been, as much as how they turned out to be. Much of Brexit Time is infused with this sense of time and timing. The easy example is David Cameron’s decision to go for an early referendum rather than to wait. The choice – a choice in time but a choice structured by time – led to a referendum on 23 June 2016 and a vote that will see the UK leave the EU. The interchange has been reported as an admission on the part of Cummings that the referendum was, and Brexit is, an ‘error’. For many this will chime with their own views, including views that key protagonists were simply playing politics, with history leaving it up to hapless politicians to try and make something of an outcome they didn’t expect and many didn’t want. But I think it is important to be clear about what Cummings is admitting or asserting. He simply entertains the possibility that ‘in some possible branches of the future’ leaving will be an error. Otherwise – and as he says in a further tweet – ‘there are more possible branches of future in which leaving is good for [EU] as well as for UK’. In essence, Cummings welcomes the destabilising effects of Brexit. For him it is a way out of a particular path dependence or a particular branch of history that saw the UK inside the EU. But at the same time, there is no guarantee that this destabilisation will be capitalised upon either by the UK or the EU. And so I don’t interpret Cummings’ response as a review of the last year and a conclusion that he and others got it wrong. Rather it is a projection forward and a willingness to accept that Brexit may not turn out to be the decisive moment of change for either the UK or the EU. If one wants to criticise Cummings it is better to take a different approach. The first is to argue that the EU has itself always been a destabilising force for Member States, requiring them to break out of narrow nationalistic patterns and to engage in structures of transnational cooperation in both economic and political terms. True, not every example will be a success, but the EU has been an evolving experiment in controlled destabilisation. The second point is that the political destabilisation which has been unleashed by the referendum is anything but controlled. The UK is rapidly becoming an example of what I call ‘un-government’. This the appearance of government but without the operation of the processes and structures capable of stabilising the system sufficiently to provide for orderly decision-making. Brexit isn’t merely shaking up government, it appears to be shredding it. And all the while, the amount of time and energy which is going into Brexit makes it impossible for the government to do anything else, including the sorts of domestic changes which presumably Cummings believes are necessary for the full promise of Brexit to be realised. Finally, the problem with focusing on time and history in this way is that it doesn’t give much space for politics, political actors and agency. By bracketing off choices and waiting to see what the branching histories of time reveal in the future, no one ever takes responsibility or is held to account for their choices and their ‘errors’. On a daily basis, we are seeing a toxic combination of indecision and poor decision-making. It is these failures which may end up with Brexit – at some point in the future – being evaluated as an ‘error’. But that doesn’t help us now whether you believe that Brexit is, and always was, a mistake, or if you believed it to be the right decision, but worry that it is being bodged by those in charge. So as much as I travel some way with the branching histories of time, this time – a year after the referendum and a month after a general election which has only highlighted the splits over Brexit – seems like the right time to ask whether we really do want to continue down the path we embarked upon on 23 June 2016. Has Article 50 Really Been Triggered? With the Supreme Court handing down its judgment in Miller v Secretary of State for Exiting the EU on 24 January this year, one might have been forgiven for thinking that the issues around the legality of the triggering of Article 50 had been settled. As we all now know, the Supreme Court decided that Parliament had to give legislative authority for UK ministers lawfully to notify the UK of its intention to withdraw from the EU. Legislation was passed and the Prime Minister duly wrote President Tusk her Article 50 letter. But Brexit is the gift that keeps on giving. At least for lawyers. For Wolchover, the notification that is made under Article 50(2) which starts the withdrawal process depends upon their being a prior decision to withdraw. Given that the referendum held a year ago was not itself such a decision, it would have to be for some other body to make a formal decision. And given that the Supreme Court in Miller made clear that as the consequence of withdrawal was the loss of a source of rights in UK law which required express statutory authorisation, only Parliament could make such a decision. Wolchover’s claim, then, is that while Parliament may have authorised the notification under Article 50(2) TEU, the European Union (Notification of Withdrawal) Act 2017 does not expressly enshrine a decision under Article 50(1) to end the UK’s membership of the EU. As with Brexit more generally, it is important to have a sense of perspective. More precisely, we need to be clear about what UK law demands and what EU law demands. It is easier to start with the latter. I have long argued that from an EU law perspective, Article 50(1) is descriptive rather than normative. It describes a state of affairs which EU law presupposes exists, and subsequently lays down procedures for the management of that reality. In normative terms, at the very most, it identifies in EU law a right which exists under international law to withdraw from a treaty. Rather than leaving it up to the Vienna Convention on the Law of Treaties to regulate, Article 50 TEU for the first time sets out the procedures which the EU will follow. But even in these terms, Article 50(1) is describing rather than prescribing something. Where EU law comes to life is in terms of the procedures laid down in Articles 50 (2)-(5) TEU. In particular, Article 50(2) is quite clear that the Article 50 procedures apply as soon as the European Council is notified of the intention to withdraw. Here, EU law is dealing with the intention to withdraw and not the decision which is – rightly – a matter of domestic law and politics. In this way, all that EU law has to contend with is the Article 50(2) notification and the consequences that then follow in terms of negotiation of a withdrawal agreement and the termination of membership. As to UK law, what is clear from the Miller judgment is that key exercises of executive power are subject to domestic legal controls. UK law does not need the wording of Article 50(1) TEU to require that such exercises of power are in accordance with domestic constitutional requirements. Indeed, as an aside, when Article 50 was being drafted it was proposed to drop this part of Article 50 as it was suggested that what was or was not in accordance with domestic constitutional requirements was rightly a matter of domestic law. But it would be wrong to read too much into the retention of this language. The Supreme Court in Miller came to the conclusion that it did,not because EU law instructed UK courts to determine the constitutionality of the exercise of executive power, but because that’s just what a UK Supreme Court should do. Author Brexit EffectPosted on June 13, 2017 Leave a comment on Has Article 50 Really Been Triggered? Premature electioneering has once again afflicted a Conservative Prime Minister. Following on from David Cameron’s rush to the polls for his ill-fated EU referendum, Theresa May’s early election decision has back-fired on a colossal scale. Far from returning to power with a predicted landslide, a political tsunami has swept aside Mrs May’s majority in the House of Commons leaving her to lead a minority government with the assistance of the Democratic Unionist Party. Speculation has been rife that the effect of the election will be to soften Brexit. Yet, speaking in Downing Street following her visit to Buckingham Palace, the Prime Minister seems intent on sticking to her original Brexit plan. As for the timetable for Brexit, the clock is still ticking and the endpoint of the negotiations remains fixed even if the start date might change. Nothing in the election changes the timeframe for Brexit. At least for now. Rather Mrs May’s political problems are domestic. The Prime Minister’s first headache will be to get the Queen’s Speech programme of legislation – much of which will be about delivering Brexit at a national level – through the House of Commons. Were she to lose a vote on the Queen’s Speech, tradition would suggest that her government would fall. However, the Fixed-term Parliament’s Act remains on the statute book and a defeat on such a vote would not itself trigger a general election. For an early election to occur we would have to go through the same process by which Mrs May embarked on her misguided 8 June election. Before that happened, the Labour leader might be asked to form a government. Yet it is not obvious that a Labour Prime Minister would be in any better position to get a Queen’s Speech programme of legislation through the Commons. Moreover, some might wonder whether the formation of a minority Labour government would really be in Labour’s interest. On the one hand, it may wish to capitalise on the party’s electoral successes and new-found popularity. On the other hand, the Labour leadership might rather that it was a Conservative Party that was forced to pick up the pieces of the 23 June referendum and carry through with Brexit. Rather than suffering from the same electoral dysfunction as the Conservatives, Labour figures might feel that it would be better to bide their time and wait for the Conservative Party to implode. Meanwhile, standing in the wings like an anxious contestant on Tipping Point, Boris Johnson might also see the virtues of waiting for the right political counter to drop and push Theresa May out of office. For his supporters, it may be about time for Boris Johnson to take over his party’s leadership. For Johnson himself, it’s about timing.